They can pop up anywhere and they are among the grossest creatures in creation. If cockroaches are scattering when you turn on the light in your kitchen, then simply schedule cockroach control service in London from PEST XTERMINATORS. Choose a day and time that suit you best for a visitation and that’s when you’ll get your treatment. 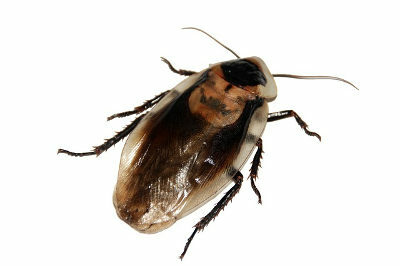 An experienced cockroach exterminator will come to your property and eradicate the pesky bugs using the latest professional methods for efficient cockroach extermiantion. How To Spot A Cockroach Infestation? It's very easy to figure out that your property is infested with cockroaches as they are not the shy type. As soon as the lights go out, they come out in search for food. However, sometimes they show up when the lights are on and even during the day. In addition to actually seeing a cockroach, you can take a look at your cupboards. If you notice a substance that resembles spilled black pepper, then that's probably their feces. Seeing shed cockroach skins is always a sign of a cockroach infestation. Cockroaches shed their skins from 5 to 8 times as they mature to adults. The skins are usually found close to where the cockroaches are sheltering. Roaches normally leave brown and irregular shaped smear marks on their trail. You’ll notice those marks on horizontal surfaces and wall-floor junctions where cockroaches scuttle along. Cockroaches produce black or brown cylindrical droppings, with ridges down the side, that resemble ground coffee or black pepper. The feces are approximately 2mm long. A large number of cockroaches combined will definitely appear to give off an specific odor. The smell is mostly described, by experts and victims, as oily and musky. What Problems May Cockroaches Cause? Similar to dust mites, some parts of a cockroach contain specific proteins or allergens that may cause allergies or can even be the reason to trigger asthma symptoms. In addition to these proteins that the cockroaches naturally carry in their bodies, scientists have discovered that cockroaches can also carry some serious bacterias (which can cause diseases) such as Salmonella Typhi (which causes Typhoid), Poliomyelitis (which causes Polio), Dysentery (a disease that causes severe diarrhea that may include bleeding). However cockroaches are unlikely to bite, so the only way to avoid any health risks is to keep them away from your food. If you do that, other than being incredibly gross, cockroaches won’t pose much of a threat to anyone. If you notice any signs of infection, book a professional and guaranteed cockroach elimination. Your pest control specialists will come to your property whenever it is most convenient for you. The service will begin with a thorough inspection of the place which will determine the level of cockroach infestation. The affected areas will be treated with an insecticide with a prolonged residual effect (at least three months). In addition, the exterminator will apply a special bait gel on various surfaces. The cockroaches will eat from the gel and die within 24 hours. Other cockroaches will feast on the carcasses and spread the gel even further which will eliminate even a larger portion of the population. When your cockroach eradication specialist is done with the treatment, he will even offer to give you some useful cockroach prevention tips against future infestations. Remove your pet animals from the property for a few days. This includes fish. Hoover all affected areas as thoroughly as possible. Make sure no food remains exposed. You can't be present during the cockroach treatment so leave the property. The place has to remain empty for at least two hours so the insecticide can settle. When you finally return to your home, air out all rooms for about ten minutes. Do not clean or hoover the treated areas for at least four days so the insecticide can do it's trick. Request for a full sanitation to completely pest-free all the infested areas in the property. Cockroaches are a species of cosmopolitan insects. From tropic jungles to forests and sewers, you can safely assume they are pretty much everywhere. Millions of years of evolution have turned the cockroach into an adept survivor. It's known that a cockroach can survive without its head for a few weeks. The urban types of cockroaches prefer the dark comfort of sewers and underground tunnels but they can also infest buildings in search for shelter and food. Usually, they target kitchens as that's where they are most likely to stumble upon food. The most effective way to deal with such infestation is with professional cockroach pest control. I used to see cockroaches every morning when I wake up. Turns out there was a cockroach nest right there in the kitchen! The good news is, the exterminator did a rigorous job and there are no scurrying cockroaches in sight.